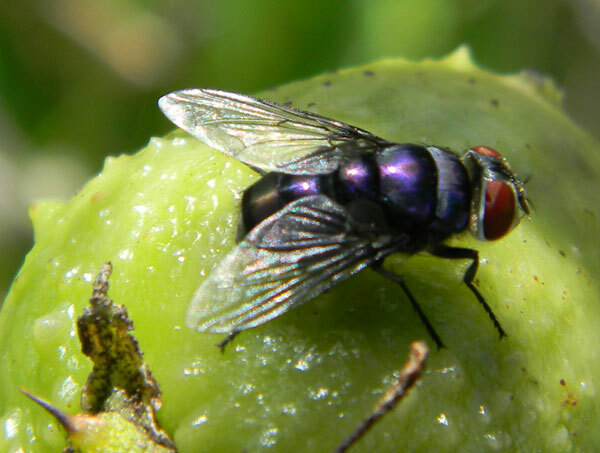 This fly is alighted on a fruit of Solanum in a farming area near Eldoret, Kenya, October 2010. This fly developed as a maggot (immature larva) in some sort of rotting flesh or dead animal. There are quite a number of blow fly species and each is differently specialized in terms of the nature and condition of its preferred larval food source. Adult flies such as this one are attracted to sweets and the smell of foods being cooked. As such they might be a nuissance, however, we should recognize that they are busy cleaning up the messes humans leave around. With a flash or blue and green they leave our world more tidy then rest in the sunshine.